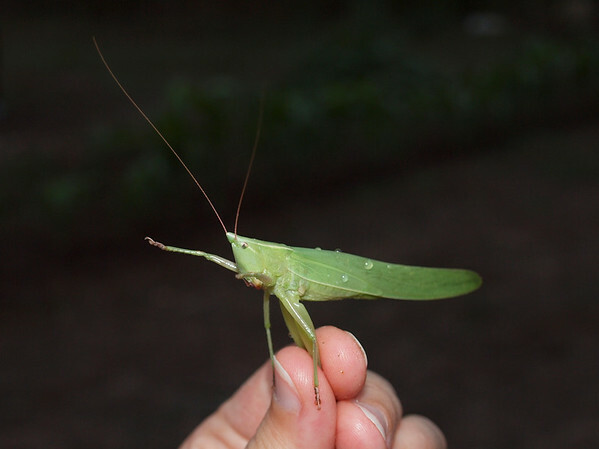 This is a rather random post, and rather than discuss katydids, I’m going to talk about books. 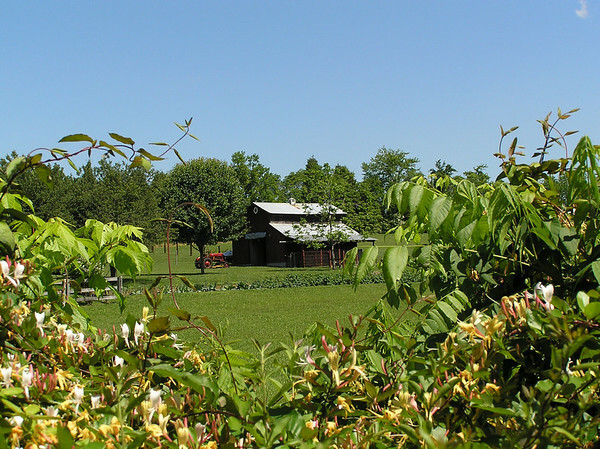 Have you ever read the Katy Did books by Susan Coolidge? I discovered them a few years ago, and I enjoyed them so much! I wish I’d had them as a girl, but better late than never, right? :-) My mom read them also and quite enjoyed them too. This is in the proper order for reading them, by the way. 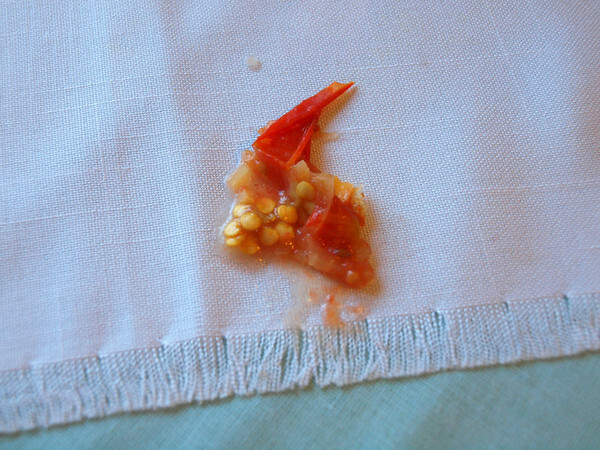 Have you ever had this happen to your beautiful table linens? Or, have you ever done this to someone else’s beautiful tablecloth? It’s a horrible feeling. Some things, like spaghetti sauce, grape juice, mustard, etc. can leave permanent stains. They are also useful for preserving fine word work on a table surface, covering tables that have grooves that collect crud, glass tables, etc. I like to put one over flat placemats too so that I can use them without the monkey fuss of wiping them off all the time. My mom has a slight indentation in her table and so she has put puzzles on her table and then covered them as a table decoration. You could also use this to protect table runners. 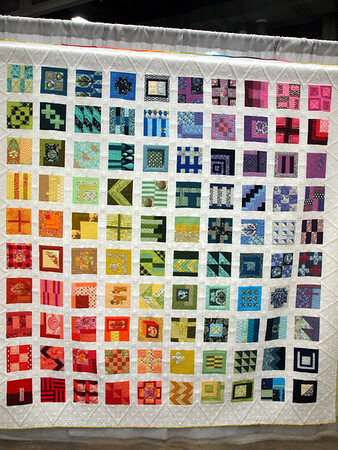 Be creative – this might make you decide to use that beautiful old quilt you have on your dining room table! It’s a great way to add color to your table too. 1. Buy the heaviest clear vinyl you can afford at a local fabric store. (I got mine in the fabric section at Wal-mart.) It will last much longer than the lighter weight stuff. I inherited one from my mom that was so heavy the corner just wouldn’t give out, even though it’s the corners that usually go first. I finally gave up on it just because it became stained, scratched and had some holes. 2. Measure your table first to make sure you get enough! 3. They will develop holes eventually, just from use and “events”. Be careful of things like using a rotary cutting mat and cutter on top of it. 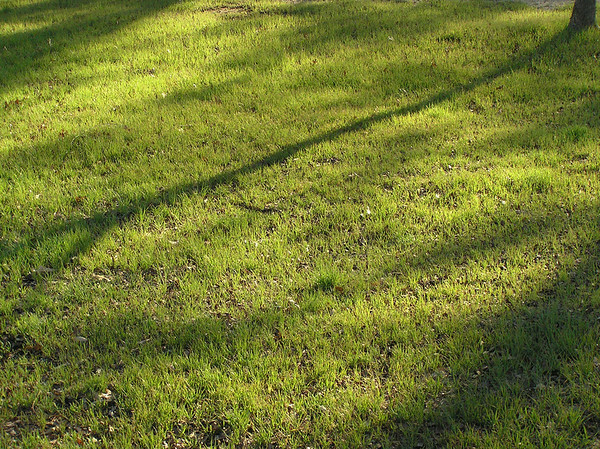 Keep your eyes open for holes so that you can avoid having things you especially like soiled by a leak. 5. I don’t recommend covering a “special” vinyl tablecloth (the type with the “flannel” backing). I did this with one and when I took off the clear vinyl some of the color from the other one came with it. 6. You will probably need an extra pair of hands to center it properly over another tablecloth or other flat décor you’re using. 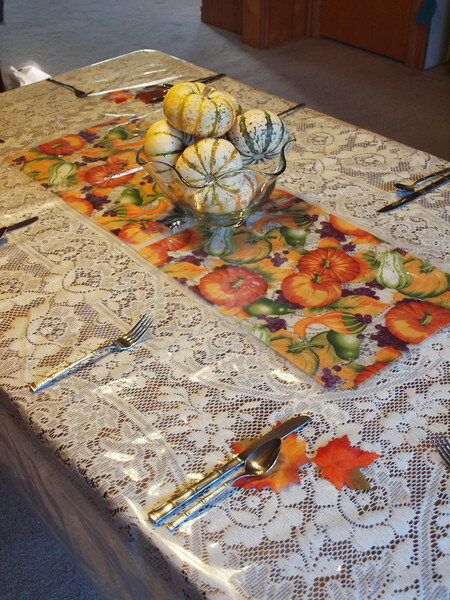 Here I used two flat plastic placemats as a “table runner” and laid artificial maple leaves cut off the stems at the corners over a lace tablecloth. 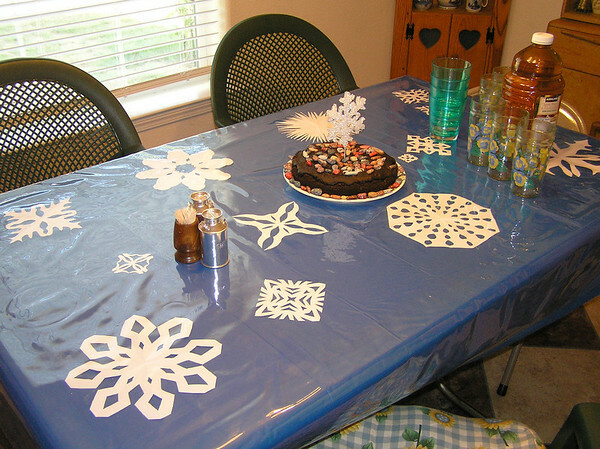 Here is my mom’s table decorated with paper snowflakes on a blue tablecloth for a weather themed birthday party we had for my brother. Pastors are only mentioned once in the New Testament by that name (Eph. 4:11). But even so, what should a pastor be like according the Lord? In Jeremiah He tells us. Here the Lord is speaking to Israel about what He will do for them in the future when they turn to Him and their land is healed. It seems to be quite clearly the Kingdom that He's talking about. However, we still learn from this verse what a pastor is like who is according to God's heart. First notice that the pastors will feed. They will not chasten nor chastise them. That is God’s job (Heb. 12). They will not rule them with a rod of iron. This is not limited to the Kingdom era. Remember Jesus' words to Peter before He returned to heaven. John 21:15 So when they had dined, Jesus saith to Simon Peter, Simon, son of Jonas, lovest thou me more than these? He saith unto him, Yea, Lord; thou knowest that I love thee. He saith unto him, Feed my lambs. 16 He saith to him again the second time, Simon, son of Jonas, lovest thou me? He saith unto him, Yea, Lord; thou knowest that I love thee. He saith unto him, Feed my sheep. 17 He saith unto him the third time, Simon, son of Jonas, lovest thou me? Peter was grieved because he said unto him the third time, Lovest thou me? And he said unto him, Lord, thou knowest all things; thou knowest that I love thee. Jesus saith unto him, Feed my sheep. Secondly, notice who they will feed. They will feed Israel - in this case believing and saved Israel, the ones who repented and returned to their God. A pastor according to God's giving does not spend all his time feeding goats. Jesus told Peter to feed His sheep and His lambs! Thirdly, notice with what the pastors will feed the people - knowledge and understanding. 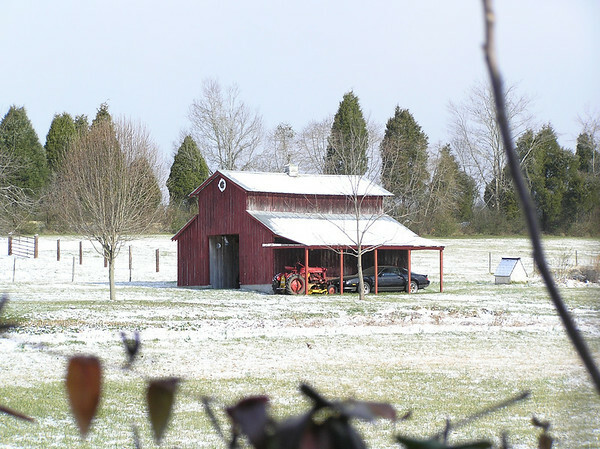 Now whether this means they will exercise knowledge and understanding or whether the food is knowledge and understanding, I don't know for sure, but you pretty much can't have one without the other, as the New Testament indicates. These good pastors will not "preach the gospel" at every meeting. They will not be reminding the people of their sin and guilt at every opportunity. They will give knowledge and understanding to those who hear them. Understanding of what? Of the will of the Lord. In all things. 2Timothy 2:7 Consider what I say; and the Lord give thee understanding in all things. Too many pastors today are preoccupied with so many other things - philosophies of man, health diets, psychologically analyzing the sheep, goat ministries ("reaching the lost")*, compelling the sheep to perform certain standards, keeping up with sports, boycotting abortion clinics, supervising the personal lives and resources of the sheep, telling or hearing some new thing (Mars Hill), "fellowshipping" with other pastors, etc. etc. etc. When you find a pastor who is according to God's heart, you will find him feeding the sheep of the Lord with understanding and knowledge. You will find sheep who are growing in grace and the knowledge of Jesus Christ. *There are men who want to be pastors but who are totally consumed by ministries to the lost while neglecting the feeding of the sheep. They need to do the one or the other – be a pastor or an “evangelist”. Trying to do both often means that the sheep aren’t fed. 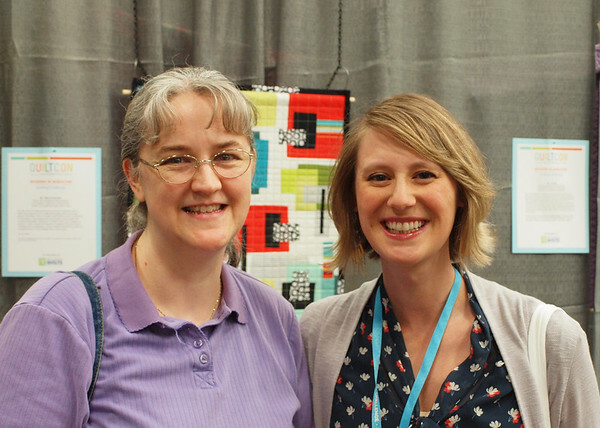 Sew Happy Saturday A Day Early – QUILTCON! 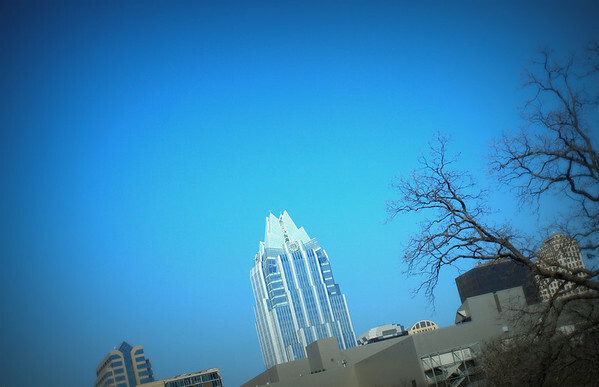 I/We took lots of pictures. 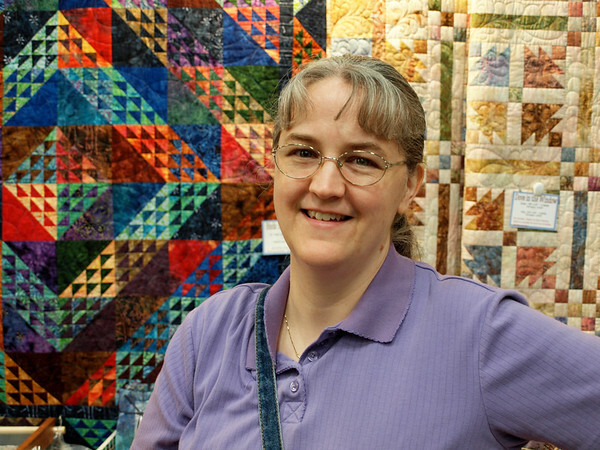 I won’t post them all here so as not to bore my non-quilting readers, but for those who are interested, I am posting quite a few here: Mary’s Quiltcon photos. Peter and I spent about 2 hours or more there because it was the only day I planned to be there. Still, we didn’t see the whole thing. A little disappointing perhaps, but when you’ve lived with limitations for awhile you try to learn to be thankful for what you can do and not lament what you can’t. Doesn’t always work, but it’s a good goal to have. I’m so thankful that I can even enjoy an event like this now! 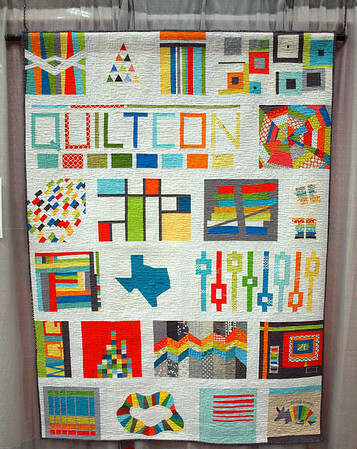 This was a rather amazing quilt done especially for Quiltcon. 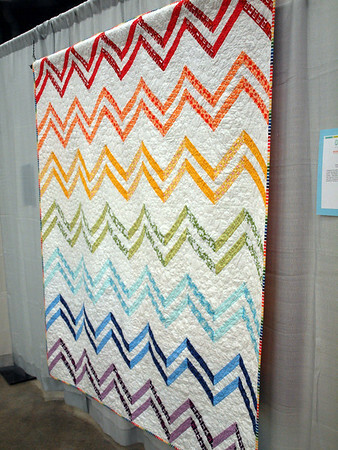 I think my favorites were the rainbow colored quilts. I especially like the butterfly quilt above. 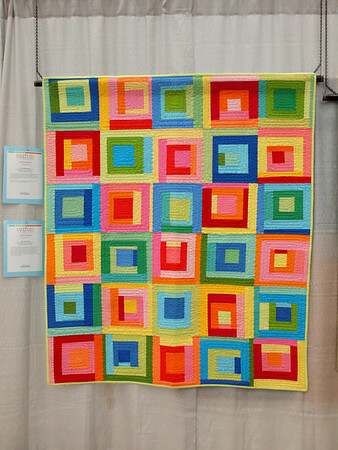 This one was a demo quilt in one of the vendor booths. It’s made with batiks. I think it’s beautiful. 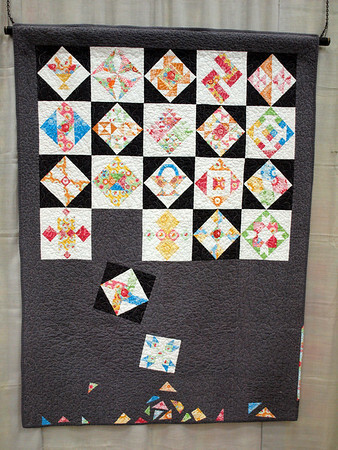 Since I mix traditional and modern myself, I was a little disappointed not to see more quilts that distinctly mixed traditional and modern among those entered and displayed in the actual show. Admittedly, though, I didn’t see all the quilts. These two did have some of that aspect, I think. Now, with all those vendors there someone is probably wondering what great loot I came home with. Well, as some of you know I’ve been working on shopping my own stuff and not spending money for awhile. Also, I tend to be a tightwad sometimes, which is maybe why my husband is OK with taking me to an event like this in the first place. :-) Anyway, I didn’t buy a thing! Nope. Not one thing! The prices were so high on the few things I was interested in that I couldn’t bring myself to do it. I kept thinking how much cheaper I could get fabric online. 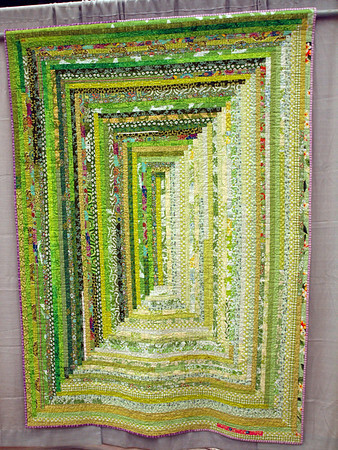 And, then too, I have so much fabric here at home….and I have more projects in hand now than I really need! 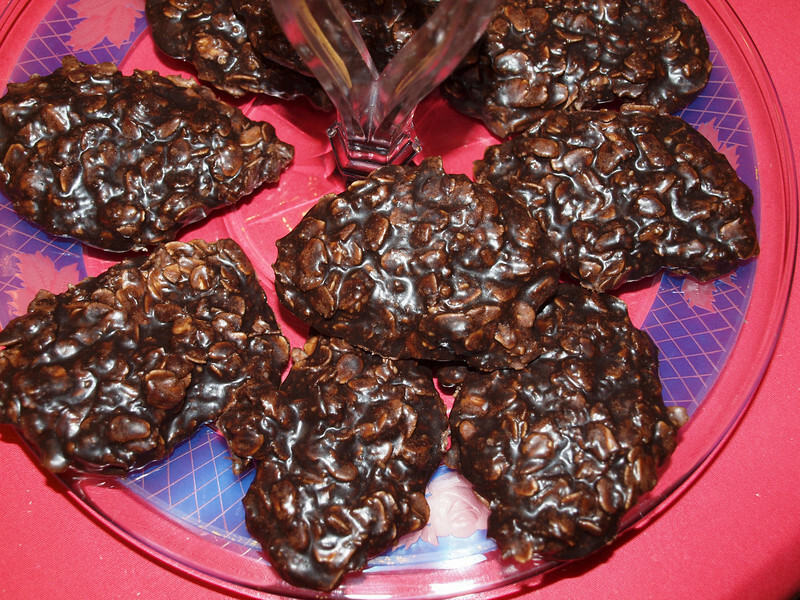 Someone told me that these are also called “Haystacks” or something like that. Some alterations that have been made in our family over the years include using coconut instead of nuts and using extra dark cocoa powder (pictured above) instead of regular. Bring to a rolling boil, stirring often, and remove from heat. Mix thoroughly and drop by spoonsful on waxed paper to cool. 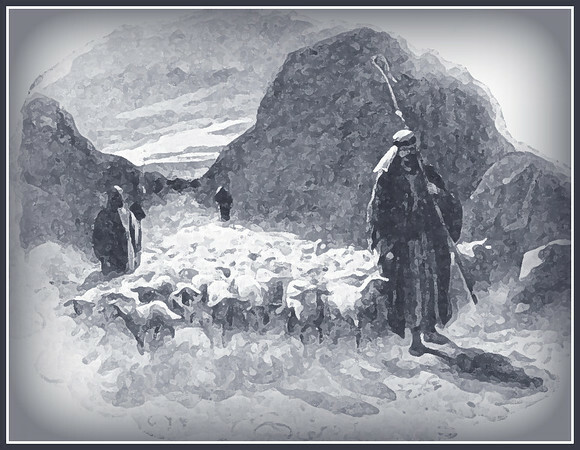 Last week I posted a couple poems about the Good Shepherd. This week I wanted to share a thought about the sheep. So, if the sheep know the good shepherd and follow Him, we can know them by where they are. Where is that? Psalm 23 tells us. 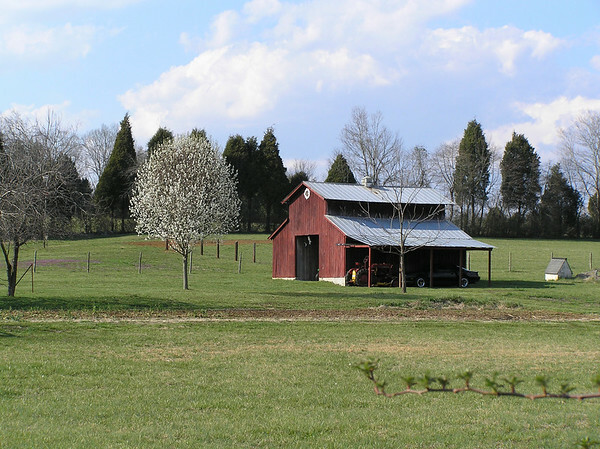 v. 2 – In green pastures and beside still waters. They will be where they can get good, appropriate spiritual food and the living waters that Jesus Christ gives. 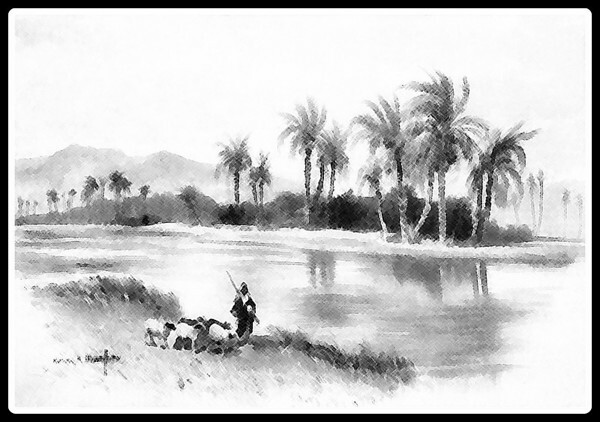 v. 3 – In paths of righteousness. They will not be walking in the ways of sin as a steady habit (1 Jn. 2:1). The Good Shepherd will call them away from sin unto Himself. v. 4 – In the valley of the shadow of death. Not all the places will be “good” places in the sense of being places of ease and pleasure. But, they will be with the Lord in those places and will find comfort from Him and from the protection that He gives them. 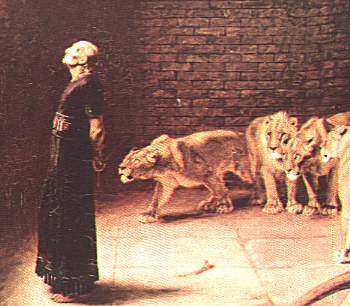 v. 5 – In the presence of their enemies. Again, not all the places are what some would call “good”. Yet, even when forced into the presence of enemies (and a good sheep will have enemies! 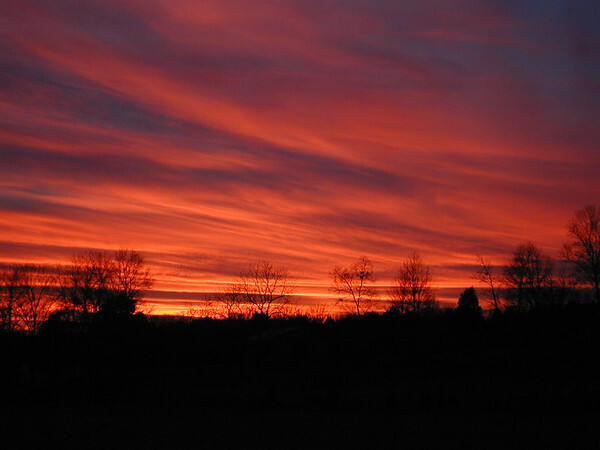 ), they will find the things they need to sustain them provided for them by their Shepherd. 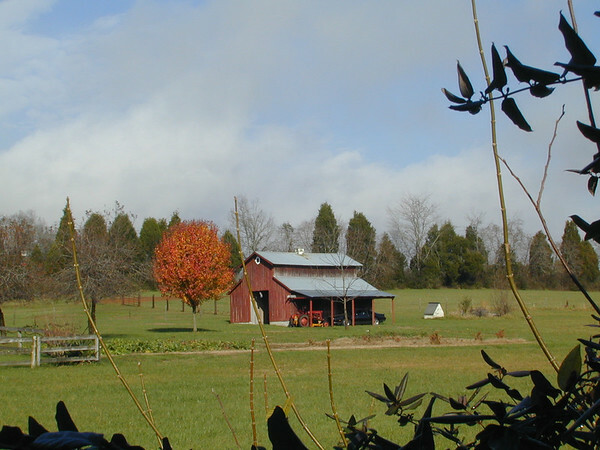 v. 6 – In the house of the Lord for ever. Some would say this is being “in church”. It has a more eternal context to it, though. I think it goes far beyond the idea of a building and focuses on being a member of God’s flock both in this life and the life to come. When we become a sheep in God’s flock in the church age, we are members all the time and for ever, not just when we’re in a building with other sheep. The main thing that we’ll always see with a sheep who hears and follows the Lord Jesus is that they are where the Lord led them. They won’t be socializing in the wolves’ den or running with goats or playing footsie with the lion. They will be following the Good Shepherd. Follow Thou Me – A poem by Annie Johnson Flint. “My Sheep Know My Voice” a good old song sung very simply. Pre-washing fabric is a little bit controversial in the sewing world. 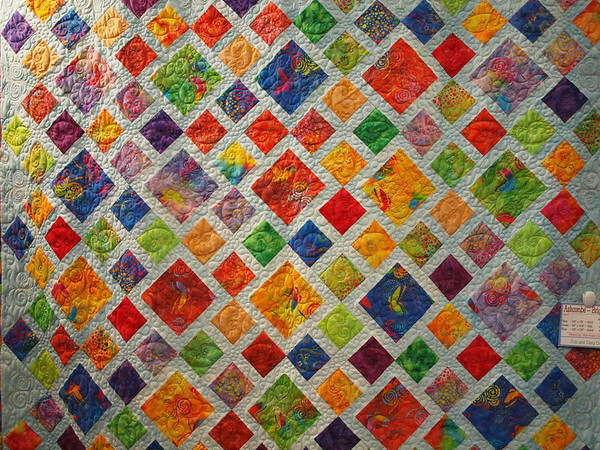 Quilters in particular are inclined to say that it’s better not to because the original starch that the fabric has in it makes it easier to cut accurately. This is true, but if you do pre-wash you can still use spray starch of some sort to make the fabric more stable for cutting. In any case, for gifts, be sure to mark the label or include specific instructions for washing so the new owner knows what they can and can’t do with it. 1. Many fabrics shrink. Some only shrink a small amount and some don’t shrink at all. Some shrink a lot. I’ve learned the hard way that you don’t want it shrinking after the item is sewn. This is a corduroy vest I made years ago. I put lace over the front in two places. Whether I knew it at the time or not, I had not pre-washed the lace and, disappointingly, it shrank! You can see the wrinkle in the corduroy under the lace here that formed from the lace shrinking. I was till able to wear it, but it was rather awkward, not to mention frustrating. 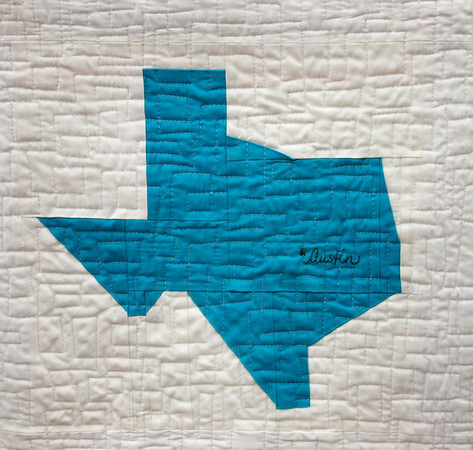 In quilting with cotton shrinkage may not be as much of a problem since it adds to the appeal in some people’s eyes – making a sort of soft wrinkly texture that can give apparent age to a quilt. However, in some cases it could be a problem so consider the situation. Whatever your project, if you have some fabrics that are pre-washed and some that aren’t, and the item will be washed later you may want to wash them all just to make sure you don’t end up with a problem. 2. Fabric colors can bleed or run. I had a friend who was given a lovely red and white quilt. I think it was made for her by her mother-in-law. She was uncertain if the fabric had been per-washed and she was quite worried about the colors running, so she decided she wouldn’t wash it. I don’t remember if she even used it because of being concerned about soiling it and then needing to wash it. She may have been using it but just very carefully. Anyway, I know from personal experience that it’s a bit of a disappointment to receive a gift that you are afraid to wash for fear of ruining it. I was given a vest once pieced of bright colors mixed with a white print. I never did wash it because I knew the lady who made it didn’t pre-wash and one of the colors was a shade that I’d seen bleed badly before. It limits the use of a garment or quilt considerably when you’re afraid to wash it! 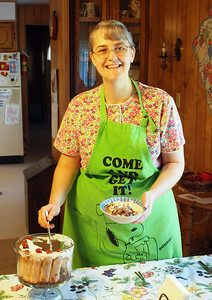 Here is a t-shirt dress that I made years ago. 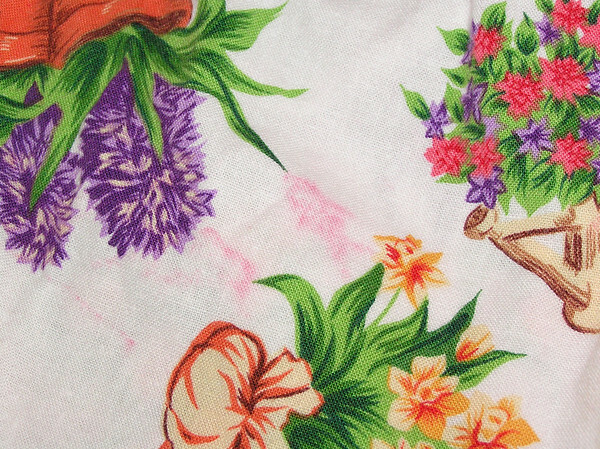 I did pre-wash the shirt before I made the dress, but I got a small grape juice stain on it one day and when it was washed we used stain remover on it. The stain remover caused the red to bleed again, and it stained the white background of the skirt. Imagine how awful this would look in a quilt project where it was more obvious. Mostly I only put larger pieces in the washing machine, other smaller cuts I hand wash. As I said, even with some pre-cuts and small scraps I do pre-wash. If it’s a very dark color and I’m mixing it with lights I probably would. In the case of small pieces, I hand wash them since the washing machine would only fray them – possibly beyond use. From experience of hand washing and seeing the water turn color, I tend to focus on pre-washing richer reds and blues since they appear to run the most. The quality of the fabric can influence the amount that the dyes will run too. The last two are lesser reasons, but still figure in my view. 3. Fabrics vary in quality and you can learn things about them by washing them. I have had fabrics that I thought were pretty nice come out of the washer and dryer a mess. 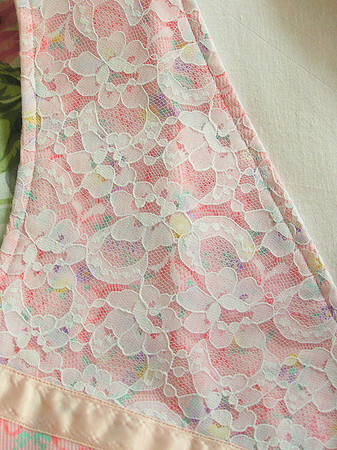 One piece I’d thought to make some clothing out of was so wrinkly that I ended up giving it away or selling it. I didn’t want the bother of ironing out that mess every time I washed it! Sometimes something that feels a little thin will shrink in the wash and can come out feeling a little better. Sometimes you’ll find something doesn’t feel as thick or perhaps it will lose it’s sheen or fray terribly. All of this will tell you things you may need to know about your fabric. 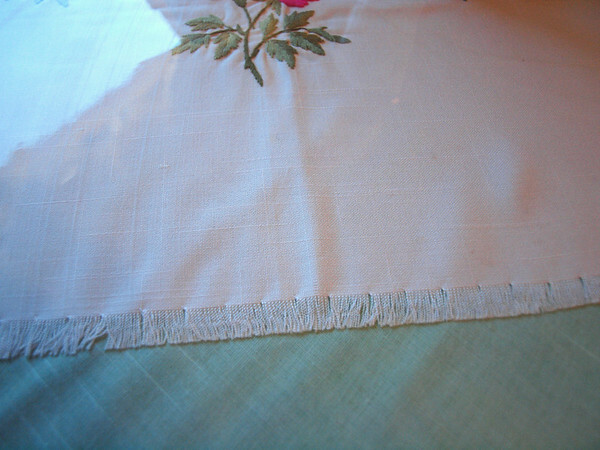 Some fabrics that are used for clothing are very bad about fraying. You may not want to pre-wash fabric like that since it could really take away a lot around the edges. For my own part, I tend to steer away from those types in general because I don’t like to deal with making sure all the inside seams and edges are covered or secured properly to avoid having the garment ruined. And, I’ve had some unpleasant experiences with “fray-stopping” type products. 4. Washing sometimes reveals unseen flaws in the fabric. This may not be a problem for quilters because they usually work more closely with their fabric and probably look at it more than those making clothing. However, it could still be a problem, especially on quilt backing. For those making clothing, this can be very important since you might not notice a small hole or slit in the fabric until it’s too late. Washing can reveal things like runs (in knits), holes and possibly mistakes in the weaving. Also, if you iron your fabric after washing it, you are more likely to notice holes, fade lines and possible print flaws. If the problem is in a bad location, it may make the fabric unsuitable for the item you intended to make. 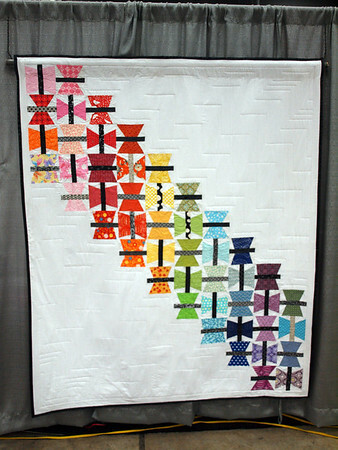 Quilters may be able to cut around it and still use the fabric for piecing, but for quilt backs or for garments, it’s important to find these things ahead of time. I’ve had holes show up after washing more than once. In more than one case it made me change my plans for the fabric or I had to come up with a way to cover the spot. I’ve also had fabric which looked fine to me before washing, but which I noticed afterwards was not dyed evenly. 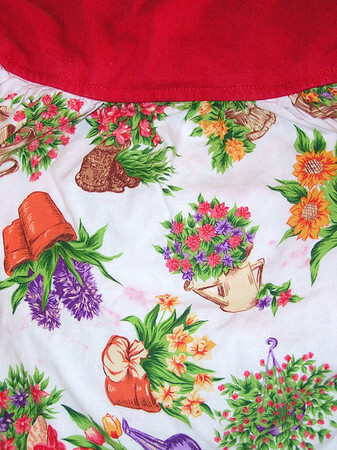 I still used that piece, but it was an every day work type jumper/pinafore from the start. 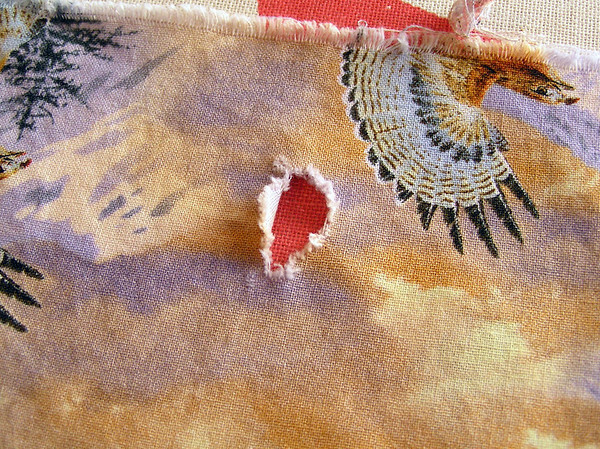 This is a fabric that I washed recently and, to my surprise, this hole appeared. I had not noticed it before I put it in the wash and didn’t notice until I was ironing. I intend to use this in a quilt project, so I can still get the pieces out of it that I need. You can see how an unwashed hole might not show up till after a garment or quilt backing was finished and washed. This would be an unhappy problem on a finished item! 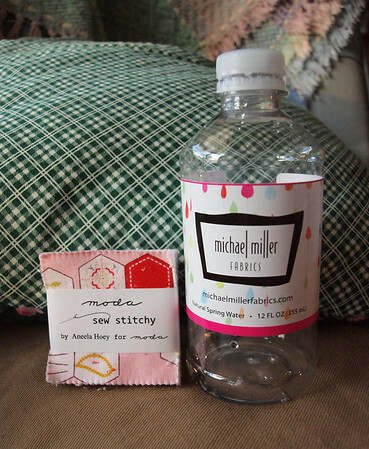 I haven’t tested this, but recently I washed some fabric that had been torn across the grain instead of cut. 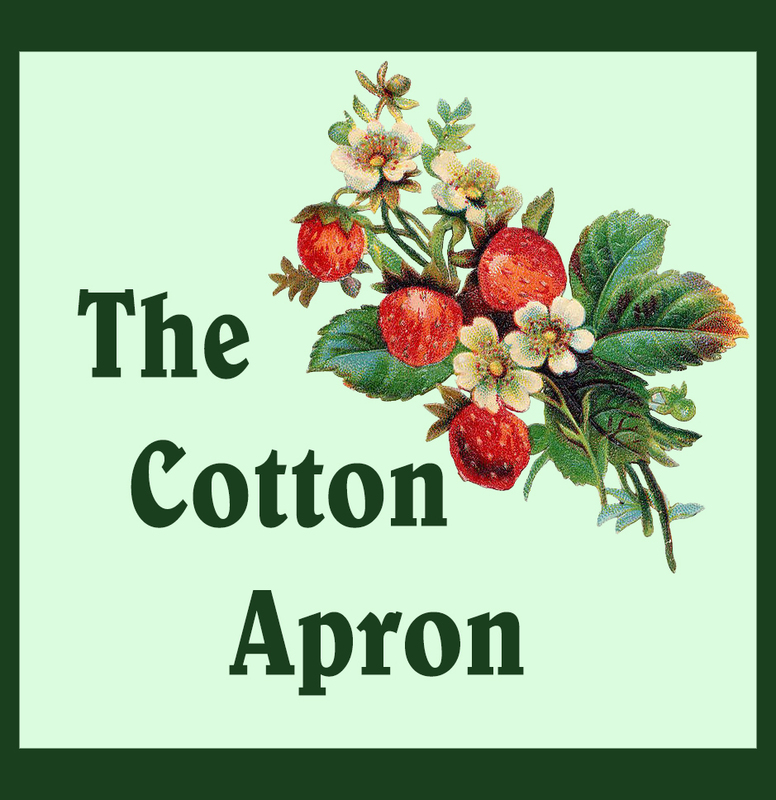 (Some people prefer to tear lengths of cotton fabric they are selling. It gives a more accurate measurement because it tears straight across the grain.) When I washed these three pieces I noticed that they did not get that usual bird’s nest of strings coming off the ends. I am interested to try this on some other pieces of cotton to see if this holds true, or if it’s just those particular fabrics that were better than the rest. Editor: These are good ideas for pre-washing small pieces. Also, I have had fabric that looked and felt pretty good come out of the wash looking and feeling quite like cheesecloth! And, removing the chemicals is another good point for pre-washing. I hadn’t really thought about that. It’s also something to think of in terms of handling the fabric. Of late, I have not been going through my fresh garlic fast enough. I’ve had some trouble with it molding or spoiling in the jar where I keep it. On the last batch I decided to do something I saw online somewhere. I chopped it up quite small, put it in small canning jars and put it in the freezer. I only cooked with it, so I don’t know if it would work well for “fresh” use. For my purposes the results were quite satisfactory. I intend to do it again, as time permits. 1) It was easy to guesstimate how much I needed. 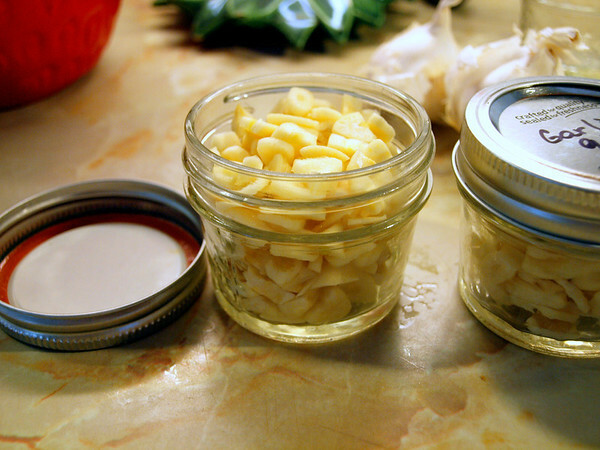 2) I was able to remove part of the garlic without using the whole lot. 3) It saved time when I was actually cooking since I didn’t have to stop to chop the garlic. 4) It tasted better than dried garlic. John 10:11 I am the good shepherd: the good shepherd giveth his life for the sheep...14 I am the good shepherd, and know my sheep, and am known of mine. Psalms 50:1 The mighty God, even the LORD, hath spoken, and called the earth from the rising of the sun unto the going down thereof. This recipe came from my Great-Aunt Lissette, via my Gramma and it is real comfort food, and you can make it even more appealing by serving it warm with a scoop of ice cream on top. Also, we’ve made it with rice flour in place of the all-purpose flour and it came out very well – even better than with the wheat flour in some opinions. :-) [I don’t recommend making it with whole wheat flour as whole wheat tends to absorb too much of the liquid.] During the baking process the layers in this “cake” reverse so that there is a cake like layer on the top and a nice syrup in the bottom. 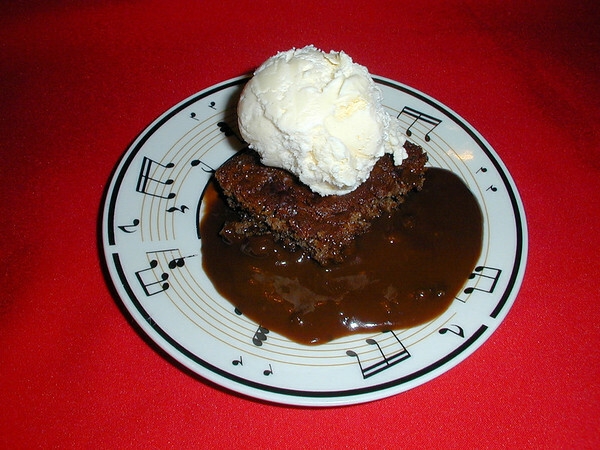 It makes a very nice warm dessert for cold weather! Pour into a greased 9 inch square pan. Pour carefully over the batter. Bake at 350 degrees for 40- 45 minutes. 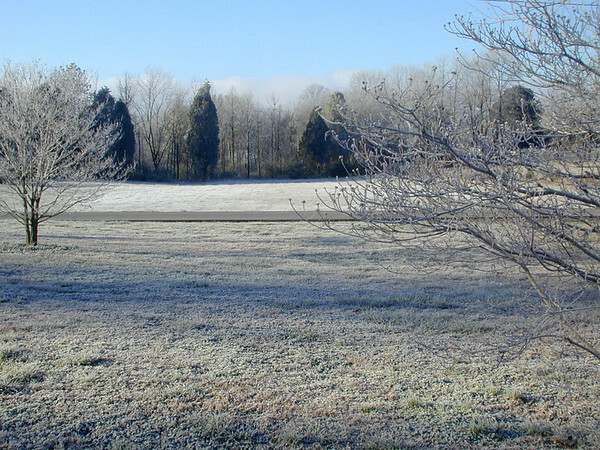 The layers will reverse during baking. This particular item that I copied and posted on my web page quite awhile back seems so needful today. We need more Christians who are willing to stand fast in the faith, even if that means standing alone. IT IS HUMAN to stand with the crowd; it is divine to stand alone. It is man-like to follow the people, to drift with the tide; it is God-like to follow a principle, to stem the tide.